2.53am on 13th May 1909 outside Hotel Loreto, in Milan. A crowd gathered as riders wheeled out their bikes to start the first Giro d'Italia. The race, just like the Tour de France, under the direction of Armando Cougnet who wanted to increase the circulation of the Italian sports newspaper, La Gazetta dello Sport. More than a hundred brave souls rolled out over the start line in front of a few hundred fans, ready to face 2,448km over 8 stages. Among them were the local heroes of the day - Giovanni Rossignoli, Giovanni Gerbi (The Red Devil), the French star Lucien Petit-Breton, and the eventual winner Luigi Ganna. The race was a real adventure for many and was a real test of survival. 127 riders began the race, but only 49 finished. In fact Giovanni Gerbi, one of the main contenders, very quickly saw his hopes dashed when a crash just 1500m into the first stage (397km from Milan to Bologna) damaged his bike. Sadly, there was no immediate mechanical support available for him so he had to hang around for 3 hours while the mechanic repaired the wheel and the frame. Those riders who managed to stay in the race had to continue through various hazards such as racing alongside galopping horses, or having to weave around herds of cattle. Of course the roads were a big problem too. The surface was completely churned up by rain and other adverse weather conditions, and there were many trenches that riders had to dodge around. The stages were so long that riders would be racing through the night, with the headlights from the following car as their only guide. It was not uncommon for riders to lose their way along the course. Needless to say this gearing was not enough to get over mountains. At that time the main "mountain stages" were in the foothills of the Appenines, with the biggest climbs being of around 650m high. Most riders had to walk up the climbs, and only the formidable Gerbi (The Red Devil), and the impressive Giovanni Rossignoli being the only riders to cycling up these peaks. With all the passion and avid following that the Giro was receiving in those days the organisers still had to pay attention to safety, and on one of the stages the organisers had to move the finish line 3 times - so much was the interest from the masses. 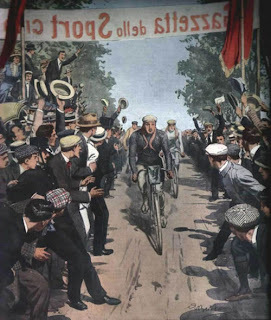 Finally, after 8 stages and 17 days Luigi Ganna won after a thrilling final stage, ahead of Carlo Galletto in the first Giro d'Italia bike race in 1909. Had the race been based on accumulated time, as it is today, Giovanni Rossignoli would have won. However, back then the winner was decided by the racer with the lowest cumulative number of points. After Ganna crossed the finish line, when asked how he felt about the win, all he could say was - "Crikey, I've got a sore bum!" 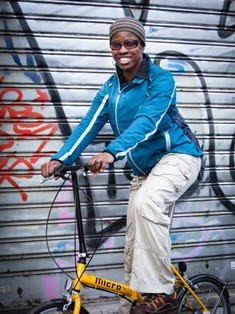 So nowadays the format may have changed significantly, and the riders are blessed with more relibale, high tech equipment to use over much "shorter" stages. What hasn't changed though is the sponsor of the event - Gazzetta dello Sport, the avidness of the tifosi, and of course the passion of everyone involved.